As Lore Prepares for war... Beleen's Birthday means MORE PINK! Yesterday was Beleen's birthday* , and to celebrate her real-life level-up, we've created the pinkest gear of the year to help you stun (or terrify!) your enemies! Gear UP in preparation for the Frostval onslaught as Karok's horde marches toward Cryostorm... then take your enemies DOWN in style! 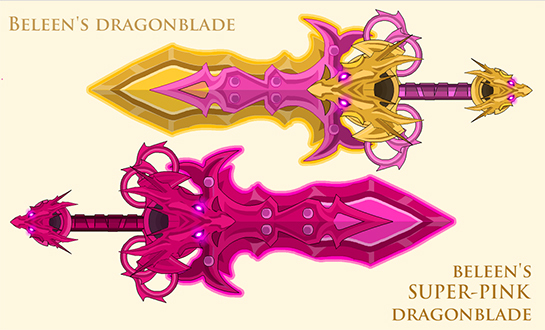 Fans of Nulgath and Beleen will be tickled pink to get their gauntlets on the blades shown above! To unlock these blushing beauties, you'll need to battle for'em! These items will all go rare on January 4th, so get them while you can... before they're gone in a burst of sparkles and new year craziness! * Beleen is the Pinkomancer, She Who Colors Lore, the Beauty among Beasts! She used to write for Artix Entertainment, but now spends her days traveling across the country, making balloons, and spreading cheer.